Youth, age 5 and in Kindergarten through age 18 as of October 1st of the current year, may join. Choose a club that is right for you. Contact a local 4-H Club Leader to see if there is room in an existing club near you. If not, several young people with an adult or two to help them may start a new club. Visit the club to see if it is a good fit. Find the project that is right for you. There are over 60 different projects. They range from arts and crafts, photography, model rocketry, foods, clothing, gardening, wildlife, woodworking, to dog obedience, small animals, horses and livestock. Enrolling your child with the desired club completes the membership process. The 4-H program is offered at a very nominal annual fee of $25 per member by Washington State University Extension in Skagit County. Ask your club leader how to enroll online. Have Fun! The mission of 4-H is to help children grow into healthy, productive, successful adults. This mission is accomplished through involvement of parents, volunteer leaders, and other adults who organize and conduct fun educational experiences in community and family settings. Volunteering is a privilege. All that’s needed is a desire to provide quality educational programs and experiences with youth. Previous 4-H Youth Development experience is not necessary. For more information, contact the 4-H Youth Development staff member at your County Extension Office. Decide that you have the time and interest to help kids explore and chart positive futures. Consider volunteering to lead a 4-H group in your community, your local school (before or after school), your church or any other location where there are kids who need positive, committed adult role models in their lives. You can also lead a family club or homeschool club. If you wish to join an existing club, call the leader and he or she will give you the paperwork to fill out. You will be enrolled as a project or activity leader. Call the 4-H office at 360-428-4270 or email dorothy.elsner@wsu.edu if you wish to start your own club. 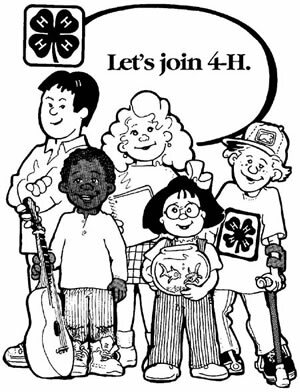 We will arrange an orientation meeting explaining 4-H guidelines and will give you the materials and publications for your new club. All adult leaders are required to attend Volunteer Leader Training. These classes are held throughout the 4-H year.